Whether you’ve been sending emails to subscribers for 10 years or 10 days, it’s important to consider how you might be able to improve your content every now and then. After all, things change over time; between your subscribers, your industry, and even your own business. As a result, it’s important for your emails to keep up with those changes, too. Wherever you are in your email marketing journey, there’s always time to recalibrate your emails. Let’s take a look at 18 different ways you can improve your content. Every time you create a new email draft, you should be asking yourself, “What will my subscribers get out of this email?” If you can’t answer that question, it’s time to close out of the draft and come back to it once you’ve figured out the value your subscribers will get from the email. Why? Because sending content your subscribers are interested in and find valuable is the foundation of any successful email strategy. If you’re not sure what your audience wants, their most commonly asked questions is a good place to start. If you run a fitness studio, for example, you can take questions your clients often ask and use that to inspire content for your emails or blog posts (which you can then send via email). 2. Explain why your emails are relevant. Sending valuable content is the key to creating engaging email content, but sometimes you have to also be clear about why it’s important. Professional writers often talk about the importance of writing “benefits-focused” copy instead of just listing a bunch of product or service features. I often find the same applies to emails, too. When you send content to your subscribers, be clear about why you think it’s helpful to them; in other words, explain what they’ll get out of completing the action you’re asking them to take, whether that’s reading a blog post, watching a video or purchasing a product. Since our goal for the email is to encourage people to click through to read this blog post, we made sure to explain the benefit to subscribers. The more you can justify the reason behind why they should take a specific action, the more they’ll understand how it’s relevant to them (and the more likely they are to take the action!). Have no clue what your subscribers want? That’s okay, too! Asking your current subscribers what kind of content they’d be most interested in receiving from you can tell you a lot about how to improve your content. Not only does this eliminate the guessing game (which can take weeks, if not months to figure out what your audience likes), it also opens up communication between you and your community of subscribers. As you begin to hear back from subscribers, start implementing what you’ve learned right away. Share content that speaks to their interests, challenges and needs! 4. Add videos or GIFs. As a result, consider how you might be able to improve your email content by adding in a relevant video. Whether it’s one you create or one that you’ve come across that would be helpful for your audience, be sure to share it via email. If video isn’t your thing (or if it’s not right for your audience), consider how you might be able to feature a GIF instead. The benefit of using a GIF instead of video is that it’ll animate within the email itself, so you don’t have to worry about clicking through to get the full impact. Whichever you choose to include, make sure it aligns with your brand. 5. Feature upcoming promotions and discounts. There’s one thing consumers can’t get enough of, and that’s saving money. Promoting product sales and offering exclusive discounts can go a long way in helping you reach email superstar status. According to Direct Marketing Association, buyers were most likely to make a purchase from an email rather than other channels like social and direct mail. With email, you don’t have to worry about your fans missing content, like they might in their social feeds. 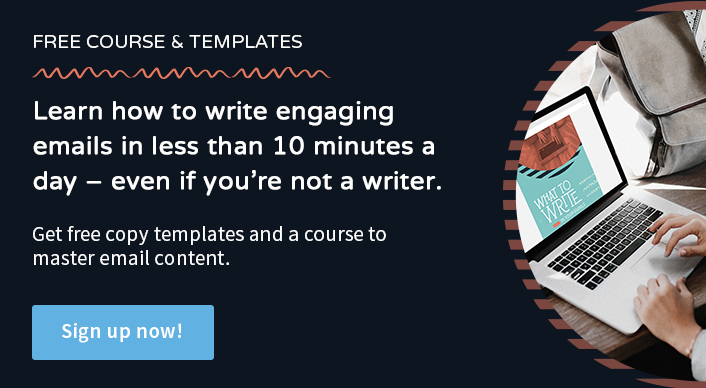 Plus, you have the chance to create eye-catching email content like this. So the next time you have a sale or discount, be sure to send an email to your subscribers about it! Personalizing your email content is more than just adding your subscriber’s first name to the subject line (although that is one cool use of it!). It’s about sending targeted content to people on your email list who will find it most relevant. Whether you send emails based on their specific interests, geographical location, native language or even favorite dog breed, you’re able to take communication to a new level. From specific welcome emails based on different incentives to a promotional email that’s only available in a specific city, there are endless possibilities for how targeted you get with your email content. Between all of the promotional emails, blog post updates and other messages you send to your subscribers, sometimes it pays to send an email with no particular goal other than to delight your community. The email was not only fun and creative, it also delivered a gift of GIFs (say that five times fast!) to our customers. And the response told us everything we needed to know about sending this kind of email: people loved it! Open rates and click-through rates were among the highest we’ve ever seen. And you can bet that we did something similar again. While a package of hand-crafted GIFs may not be right for you, think about what you can give away to your subscribers. Or, consider other ways you can add little elements of delight into your regularly-scheduled emails. The Microsoft Paint-inspired visual brings humor to what would otherwise be just another email update. And their use of emojis adds another subtle element of delight. 8. Regularly clean your email list. In some cases, your email content may already be stellar. But if your open and click-through rates are low, that could mean it’s time to do a little email list hygiene. As your email list grows, some subscribers may become less interested in your emails over time – and that’s okay. Since email engagement is measured by the number of people interacting with your emails, these metrics can get thrown off by individuals who no longer wish to be on your email list. As a result, you’ll want to give them the opportunity to stay on your list (which you can do by running a reactivation campaign) and remove email addresses who don’t respond back to you. When you have a list of engaged subscribers, you’ll notice that your open rates, click rates and more will increase as a result. 9. Review your email analytics. In order to maintain a healthy email list, you should regularly review the performance of the emails you send. Whether you review each individual broadcast email the day after you send it or make it a point to check your analytics every week, the main idea is that you’re seeing what’s working and what isn’t. As you notice dips and upward spikes, you can use this insight to better inform the email content decisions you make moving forward. Reviewing your analytics isn’t difficult, but here’s a helpful guide to read as you get started. 10. Pay attention to design. The look and feel of your messages are just as important as the words you write. And if ignored, it can be a huge turn-off for your readers. As you consider the design of your emails, there are a couple of best practices to keep in mind. First, embrace your branding. Between the color palette and images you choose, you want to make sure your brand is represented consistently in your emails. If someone signs up to your email list from your website, for example, the experience should be visually consistent so they can recognize you and trust you’re a credible business. Second, be consistent. While you do have the freedom to be creative with your email content, the foundation of your emails should be consistent. This includes the color scheme, logo placement, and structure of the email. 11. Repurpose your best content. When it comes to sharing content in your emails, you don’t have to solely rely on freshly published content on your blog or social channels. You can also reshare older, evergreen content that performed well for you in the past. This is the simplest and easiest way to craft an email you know your subscribers will enjoy reading. For AWeber’s weekly blog digest email, for example, we recently added a section called #ThrowbackThursday, which allows us to highlight older blog posts that received a lot of traffic. This is helpful for those who may want a refresh on the topic, or for new subscribers who signed up to the list after the post was first shared. 12. Give away a freebie. Remember the “Delight your subscribers” tip from earlier? Giving away any free item is an easy way to boost your email content’s performance. Freebies can give you more insight into what kind of content your subscribers are most interested in, and it makes them feel special. Whether it’s an educational course, sample item, or trial of your service, freebies are perfect for delighting your audience. Launching a new product or course soon? Or maybe you’re in the middle of planning a huge end-of-year sale? You might want to think about giving your email community exclusive, early-access. Or, consider other items you might be able to give away solely to your subscribers. Why? Because when you make your subscribers feel like they’re part of an exclusive group, it gives them more incentive to stay on your list. In this snippet of the email, you can see how Jill highlights the exclusivity of the olive oil offer. If you want to improve your email content, sometimes all you need to do is spice things up a little bit. And if you’re interested in doing just that, you may want to consider making your emails a little more interactive. Interactive content brings a fresh approach to email design as it gives new life to the typical static message. While this doesn’t necessarily make an email more relevant to your subscribers, it can make them more fun and interesting. When you give your subscribers a fun way to get involved with your email (beyond simply reading the text and clicking links), it can improve engagement with your emails, delight your subscribers and simply help your brand look really cool. While interactive emails do require more effort and HTML knowledge, I encourage you to find an interactive element that would be achievable for you. Here are some ideas we’ve tried in the past, along with advice on how to get started. This may have been the mantra of your schoolteachers back in the day, but there’s a reason why they obsessed over details like grammar and spelling. And it all comes down to how these errors can be perceived by your readers: for many, it can make the writer appear sloppy and unreliable. Before you send out any email, send yourself a test so you can review the content and check for spelling and grammar errors. You should test the links to make sure they work properly as well. 16. Keep your content focused. In today’s busy world, it’s more important than ever to keep your emails brief and to-the-point. Think about the kinds of situations and environments in which your subscribers are reading your emails. Chances are, they’re checking their emails when they’re walking down the street, waiting on the subway platform, waiting in line at the grocery store, etc. The average attention span of a person is only three seconds – which is less than that of a goldfish! So make sure your email content is focused. 17. Write a compelling call-to-action. Every time you send an email, there’s a reason why you do so. Whether it’s because you want them to read your latest blog post, purchase a product or simply download an exclusive freebie, it’s important to make it clear what action you want them to take. While there isn’t an exact science to how you structure your emails, keep in mind your subscribers’ short attention spans and provide them with a way to take action early on in your email – and make it stand out. To do so, there are a number of factors to consider, including the size and color of your CTA button, content and length. Whether you prefer hyperlinking your text or using a call-to-action button with a color that pops, your goal should be focused on making it easy for subscribers to take action. As you discover the type of content that resonates best with your subscribers, it’s important that you keep your emails consistent. While it’s a good thing to try out new ways to make your content even more awesome for subscribers, I encourage you to do so over time. When you set certain expectations for the email content you send to your subscribers, it’s important that you meet them. This helps establish trust between you and your audience, which can reduce unsubscribes and spam complaints. Improve your email content today! Now that you’ve read through 18 ways you can update your emails, it’s time to pick one and get started! By setting one small, achievable goal, it becomes a lot easier to improve your emails over time. Just remember to keep your subscribers in mind, and your email success will follow. As we all know that there is a flood of promotional and other emails in this internet industry. So there must be effective content in your emails and also Heading must demonstrate the whole meaning of the description of the mail otherwise no one is going to open our Emails. You have described all these points in a very descriptive manner. thanks for this post. keep posting such information.